Host Susie and regular contributor Maurice welcome midfieldpress.com’s Fletcher to discuss the wins against Hannover and Paris St. Germain and more. Hannover is up first as the trio discuss the midfield dominance of James Rodriguez and Javi Martinez in the 3-1 victory. They rue Bayern’s conversion troubles while praising the opposition for taking a run at the home side, and give oodles of praise to Kingsley Coman and James under Jupp Heynckes. Moving on to PSG, they discuss whether Sebastian Rudy was the right guy for the single pivot, Corentin Tolisso’s fantastic match and how Heynckes completely outfoxed Unai Emery with his very un-Bayern-like tactics before Susie and Fletcher wildly, yet entertainingly, segue off course to chat about yellow and red cards. Maurice brings it back together by talking about the defensive work of Coman and Franck Ribery against Paris, before they move on to discuss the arbitrariness of the newly released ESPN FC 100 rankings with a definite bias towards the Bayern players included. Thank you for listening! 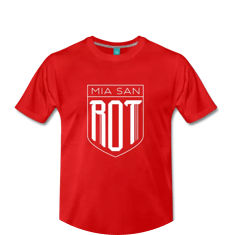 Mia san mia.